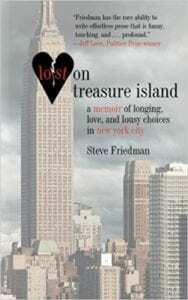 This amazingly written material is a memoir of ‘longing, love and lousy choices in New York City.’ Written by a stellar author who has the ability to build a rapport with readers by telling his own life experiences with intelligence and humor, this book is a true literary gem. When we begin, Mr. Friedman is in the frighteningly fast-paced world of New York City, where he has come to a job interview to be a writer at GQ magazine. This is a man who has a great deal of secrets in his background, such as; the fact that he’s a recovering addict, a man who can’t find a steady girlfriend, and who was just fired two days earlier from St. Louis Magazine where he held the position of editor-in-chief. At this NYC interview, Steve is sitting down with Art - the editor-in-chief of GQ, who is sometimes referred to by employees as a wonderful teddy-bear type, while others refer to him as El Jefe or ‘The Big Man.’ It’s a terrifying meeting; especially if you look at the most amazing city in the world with big eyes and find that the Manhattan world is truly a horror-show. And the one thing you don’t want to discover? The fact that when you purchased a pearl-gray suit in St. Louis for this occasion - which looked gray in the fluorescent lights of the store and the GQ offices - you discover it is actually lime green when walking in the outside world. Even a mime on the street, who’s supposed to be non-speaking, allows himself a small “peep” to let Steve know…“Nice suit.“ Can’t get much more embarrassing than that. Steve tries to speak about GQ subjects from literary fiction to sports; he covers all the manly bases, while nursing an extremely delicate stomach. But his ‘act’ is bought, and Art hires Steve to be a writer for the illustrious magazine. As readers follow Steve through life in the City, he tells the stories of many women he meets along the way, as well as his ideas for making his GQ articles much more than simple “fluff” pieces about celebrities. Steve, (much like Jerry Maguire did for sports), wants to create in-depth interviews that speak about what celebrities really are, not what they look like. Unfortunately, the idea doesn’t fly, and Steve eventually finds himself to be an independent writer trying to contribute articles to various magazines before losing his nest-egg. From all the challenges he must face in his personal and work life, Steve takes readers on a ride of drama, entertainment, fun, and thought-provoking moments. He talks about experiences he has at meetings - where he goes to find true love - as well as personal moments with his nephew Isaac, and how it is to look at life through “innocent” eyes. Every chapter draws readers in to Steve Friedman’s life where, at times, you will love him and route for him; while other times, you won’t mind that he “got what he deserved.” Either way, the material is outstanding and Steve Friedman has done a powerfully good job! Quill Says: From poignant characters such as, ‘The Fat Man’ to Psychic Rose, this is one memoir that feels like a thriller, romance, and adventure novel all rolled up into one.